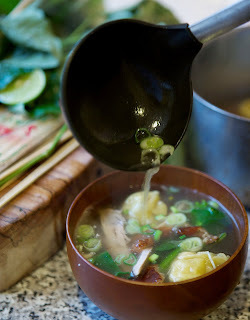 This is a my version of a simple, but utterly delicious, soup I ate in Chinatown Bangkok on my last visit (see the pic in my original post here). I remember being shocked at how tasty it was - not full of complex flavours like so much of Thai food, but just perfectly balanced and with each ingredient delicious in it's own right. I say Thai food...the boundaries between Thai and Chinese food are sometimes pretty blurred, especially in Bangkok. As far as I understand it this can be called Thai food, but the but the tastes and techniques all originate from China (but then so do so many things - almost all noodles, the techniques of steaming, stir-frying etc etc). Whether Thai or Chinese it's a delicious dish, which is obviously the most important thing. For starters I picked up half a roast duck from Chinatown, plus some Chinese kale, oh and some fresh wonton skins (though you could use the ones you find in the freezer sections of Asian stores). Plus a handful of raw prawns (there's a really cheap fresh seafood supplier hidden in a back alley just off Chinatown...here). I made a simple Chinese / Thai style chicken stock base - using a couple of chicken carcasses which i pre blanched and rinsed then covered with cold water and add few mild flavourings...couple of Chinese cabbage leaves, clove of garlic, couple of white peppercorns, few ginger scraps, couple of coriander roots and spring onion trims. I then took the meat off the bought 1/2 roast duck and added the bones from that to the stock pot too. The rest is pretty simple...for the wonton filling I peeled, de-veined the prawns and then chopped them quite fine. I added finely chopped ginger & some spring onions and seasoned with pinch of white sugar, white pepper, salt and teaspoon of light soy. Then just balled up the filling and placed on wonton skins, painted edges of the skins with little water and brought up the sides to encase. To finish I strained the stock - it had simmered for an hour and a half or something - then added some to a pan (use the rest for soups, curries, in stir fries etc), brought it to the boil and seasoned lightly with little oyster sauce, light soy, salt, white pepper and pinch white sugar. Then added some Chinese kale pieces, followed by the wontons a minute later. In the bottom of the soup bowls I put some sliced spring onions and a couple of coriander leaves, plus a nice amount of sliced roast duck. By this time the wontons and veg were just cooked and ready to be ladled over with the hot stock. Few dots of roasted sesame oil shaken over each steaming bowl and the soup was finished. Only ten years more practice and I'll be good enough to push a soup cart round the streets of Bangkok.